travel | Leon Marais Travel Writing and Photography. The Kruger National Park is situated in the extreme north-east of South Africa, making up a large portion of South Africa’s border with Mozambique. It runs from about 25 Degrees South along the Crocodile River in the south to about 22 Degrees South along the Limpopo River in the north. The Kruger National Park itself is approximately 20 000 square kilometres / 7600 square miles in size. That’s comparable to Wales. If you include the adjoining private reserves to the west and the Limpopo National Park in Mozambique to the east, then you get to an incredible figure of around 35 000 square kilometres / 13 500 square miles! The park is 380 km in length and averages 54 km wide. The park was proclaimed in 1898 by the President of the Transvaal Republic, Paul Kruger. It was originally known as the Sabie Game Reserve and was much smaller in size. In 1926 it was joined to the Shingwedzi Game Reserve to the north to become the Kruger National Park. The first motorists were allowed to enter the park in 1927, for an entrance fee of 1 Pound. Pretoriuskop in the south-west was the first area open for day visitors (there were no overnight facilities initially) and it was proposed that they be charged for photographs in order to raise revenue and that only revolvers were to be permitted, for reasons of personal protection! The Kruger has an incredible number and diversity of species: 336 trees, 49 fish, 34 amphibians, 114 reptiles, 507 birds and 147 mammals, more or less. Of course for most tourists the big mammals such as Elephant, Lion, Rhino, Giraffe and Hippo are the main attraction, but for those with a broader interest there is plenty more to see. The birding is superb, to say the least, with daily figures in the summer reaching up to 120 species and over. Combine this with unexpected and exciting encounters with the big mammals, and you have a wildlife destination that is hard to beat. What is the habitat like? The Kruger falls into a woodland savannah biome. Far from being uniformed however, the aspect, rainfall regimes and underlying geology result in around twenty specific vegetation types. These vary from the Pretoriuskop Sourveld of the south west, characterised by tall ‘thatching’ grass, dense vegetation and marshy areas, to the open Knob-thorn Savannah of the south-central regions and the extensive Mopane Veld of the north. In general it is much less open than what many visitors expect (due to the fact that most African wildlife documentaries are filmed on the grassland savannahs of East Africa). Each vegetation type has specific birds to look out for, and to really get a feel for the park one should visit at least three camps / regions. It is a great place to visit at any time of the year. If you want to maximise the birding however, then mid to late summer is best, from late November to the end of March. This is when resident birds are breeding and Palearctic and Intra-African migrants are present. If you want to maximise the mammal viewing, then you need to be there in the dry season, July to November, and if you want a compromise between the two then October and early November is the time for you. As I said though, any time is a good time in Kruger! Here we are assuming that you are the typical Lawson’s client, in that you are passionate about all forms of wildlife and don’t get tired of going out in search of wildlife for a large portion of the day (i.e. : long morning and afternoon drives with optional rest periods during the hottest part of the day). Thus our recommended length of stay, considering that you will probably be on an extended tour and will thus be visiting other parts of the country as well, is around 5 to 6 nights, split between three rest camps (typically Satara, Skukuza or Lower Sabie, and Pretoriuskop). This combination gives you a good spread of habitats and bird species and still allows you to devote enough time out of your 12 day vacation to see other places. However, one can easily spend more time in Kruger and in fact we have clients who spend three weeks per year just in the Kruger, usually doing a south-to-north or north-to-south trip during that time. Many other birding and wildlife tours will include only two or three nights in Kruger, but we don’t think that gives you enough time to do it properly (and we like to do things properly!). The Kruger has discernable seasons. Summers (November – April) are generally hot and humid. Expect average daily highs of around 32 ºC (though it can peak in the high 30’s), and lows of 19 – 20 ºC. This is the rainy season. Rain can come in the form of afternoon / evening thundershowers or extended light rain. Occasionally unusual weather phenomena can result in very heavy rain over an extended period, and local flooding is possible under such conditions. Winters (June – August) are mild and dry (the cool dry season), with very low humidity. Expect average daily highs of around 25 – 30 ºC and lows of around 10 ºC. It can go down as low as 3 or 4 ºC however, so be prepared for it, especially if you are doing open vehicle safaris! September – October is another season altogether (the hot dry season), which combines the temperatures of summer with the dryness of winter. Which areas are the best? There are 16 main camps, 5 bushveld camps, 2 bush lodges and 8 private lodges in the park, so there’s plenty of choice. Game viewing is generally better south of the Olifants River while the far north has the most bird species, but this does not make a huge difference, especially to the first-time visitor. The south-central region is my personal favourite, but you can have an incredible experience anywhere. What tour should I join? If you are a birder our Barbets, Bee-eaters and Big Game set-departure is based on a five night Kruger stay. Our Hornbills and Hyraxes set-departure includes time in the Kruger as well as some other great parks and is a winner for wildlife. Our Photographing the Predators set-departure includes the Kruger and the neighbouring Sabi Sand Game Reserve and is great for predator viewing, general game viewing and photography. Our Wildlife of the Cape and Kruger includes two of South Africa’s iconic regions, the Western Cape Region and the Greater Kruger National Park (includes a stay at private lodge). Our Cranes, Rollers and Raptors set-departure includes the Kruger as part of an extended Eastern South Africa and Swaziland birding experience, and lastly, for something a bit different, our Eagles, Elephants and Baobabs set-departure includes the northern Kruger national park, a region less visited and well worth it. See www.lawsons-africa.co.za for more info.  Ease of access: it’s easy to get there and to get around. Roads are very good.  Logistics: bookings, accommodation etc are organised and efficient.  The subtle variety of habitats, changing all the time as you drive along.  Easy birding: many of the birds are perch hunters, sitting right out in the open.  Excitement of mammal encounters: you just never know when a Lion or Leopard is going to pop out in front of you. Destination Feature: Nelspruit in a nutshell. Nelspruit is well situated as the gateway to some incredible parts of the country, such as the Kruger National Park, the Escarpment and Panorama Route, the trout country of Dullstroom, the beaches of southern Mozambique and even the charms of Swaziland. All of these destinations are between one and three hours drive from Nelspruit, making for plenty of available activities. Nelspruit is also a gem in its own right, sporting absolutely superb National Botanical Gardens, two local nature reserves, plenty of shopping for those so inclined, and also plenty of open space. In terms of size it’s deemed to be just right by many of the residents, as it’s big enough to have almost everything one would need in negotiating this modern lifestyle, but small enough to be able to get from one side to the other in less than 10 minutes, rush-hour notwithstanding. All in all it’s a wonderful place to live, and few are those who would rue the move to Nelspruit from other parts of the country (and especially the ‘big smoke’ of Gauteng). 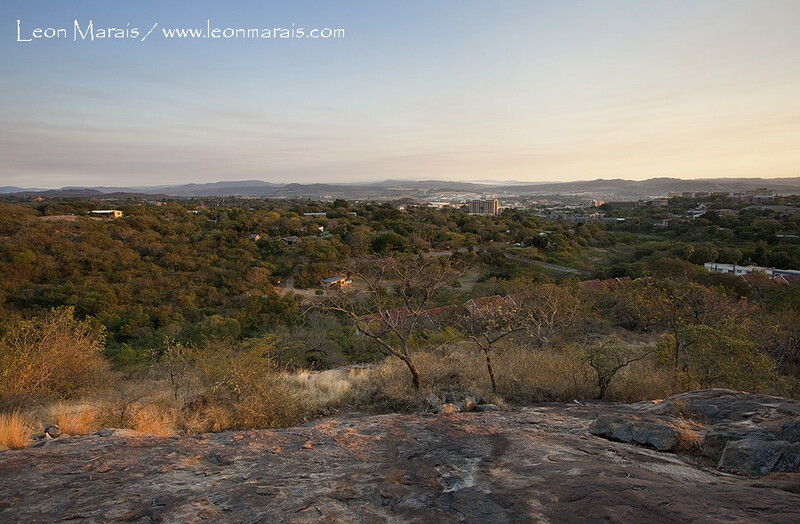 So there you have it, Nelspruit in a nutshell, and we hope to see you in our little city sometime soon. Note that Nelspruit is supposedly called Mbombela now. Camera: Canon EOS 5D Mk 11. Lens: Canon EF 17-40 mm f/4L USM. A blend of two bracketed images to bring out the best of the lights and darks. Location: Augusta Street Reservoir area.